Tonight, Thurs Jun 13th was to be a second opportunity for me to fly and test the FORCAST grism suite on SOFIA. However, that flight had a RTB or return to base, due to an aircraft item that manifest itself inflight. The pilots were awesome and returned us back to Palmdale, CA, safely. They followed their checklists and since most of tonight’s flight was to be thousands of miles over the Pacific, return to base was the right course of action. The flight is now rescheduled for next Tuesday. I am hoping I can remain on the passenger manifest and I can always do remote support. For those who follow the SOFIA story, it has been a longtime coming. But you just have to admit it, SOFIA is just cool. First of all, airplanes are cool. 747s are even cooler. And to have a hole cut into a 747 to outfit it with a telescope that can point, even in turbulence, is just the coolest of coolness. I know I always knew that, but in all honestly, I did not realize it until I experienced it. I hope you have enjoyed my blog updates on this experience. SOFIA is also an amazing piece of engineering. If you think about it, a lot of engineering has gone into the airplane, the modifications to support the telescope, the telescope design and operation, all the different science instruments, and the support infrastructure to make it all happen. Thanks to all the people who made this unique observatory possible, and those that are working hard today getting it operational. 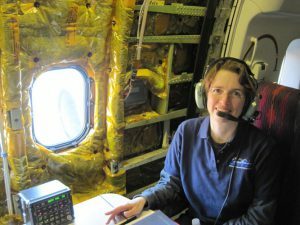 For those interested in applying to be SOFIA Airborne Ambassadors, definitely check out that amazing program (http://www.seti.org/sofia). The current application period is closed. But check in the future for the next call. Terry Herter (Cornell), FORCAST Principal Investigator & many-time SOFIA flyer, remarked to me, “After a few minutes in the air, you forget you are in an airplane.” And that’s precisely that. I thought I was observing at a telescope observatory. The only drawback: I could not walk outside to look at the stars, as I just love to do when I am a dark site, like at an observatory. But that’s okay, I was using state-of-the-art instruments to look at the stars with a different set of infrared eyes. I’ve just completed my first flight on the StratosphericObservatory for Infrared Astronomy, SOFIA. Wow! What an interesting experience. I’ll break down my comments on this first flight into several shorter blogs. When I awoke late morning (as I was trying to get onto a night shift), I obtained the list of targets planned for tonight’s flight. We are still commissioning these “modes” on SOFIA so we chose bright, standard objects that have been observed regularly by other instruments over the years. Tonight’s targets were R Leo (a red giant star), NGC7027 (a planetary nebula), alpha Boo (also known as Arcturus, a K1.5 IIIpe,orange giant star), R Cass (M-type, red giant variable star of MiraCet type) and T Mic (a M7-III giant, semi-regular pulsating star). 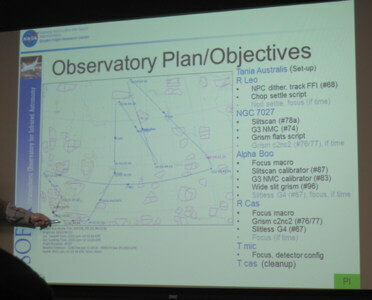 The targets were taken from a list of calibrators we assembled and chosen because they were visible to a USA-domestic flight plan for SOFIA for the middle ofJune. If we flew at another time, we would have used other similar type objects. But these five objects would be our guides on this flight. With the target list came a list of the specific measurements we planned to make on each target. We’ve had to deviate from the original planI helped write months ago, only because the two previous flights had been cut short. So this revised plan tackled the largest holes we needed to address. At 5:25pm local time, I attended the Crew Briefing. Here theMission Director Charlie Kaminski did a roll call of all the people to fly aboard SOFIA tonight. 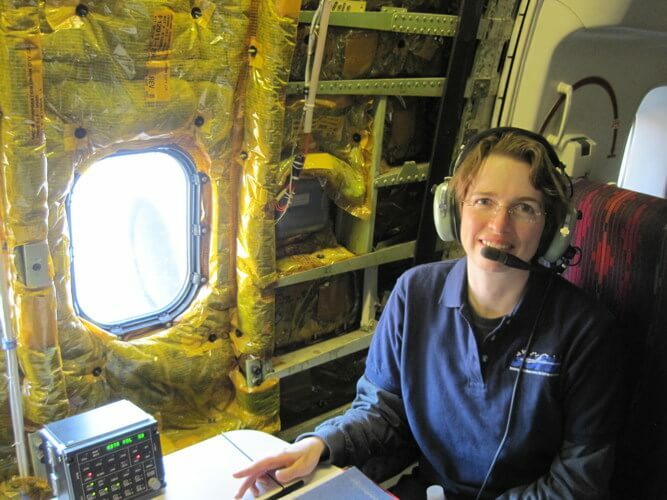 There were 5 staff (pilot, co-pilot, flight engineer and two safety techs), three telescope operators (only two are needed, and one was in training), the FORCAST science instrument support team (for both imaging and grism modes, about 9 of us), Dana Bachman (SOFIA EPO lead) and 4 SOFIA Airborne Ambassadors, Beth Hagenauer (NASA Dryden PAO) who was shepherding a television crew (about 4-5 people), Tom Rolling (NASA Ames) who ran an EMI test between his water vapor monitor facility and the FORCAST instrument, the support staff for the on-board MCCS system, and the Mission Director and Flight Planner. All in all, thee were about 30 folks on this flight, a complement typical for these early flights where lots of activities are occurring simultaneously. 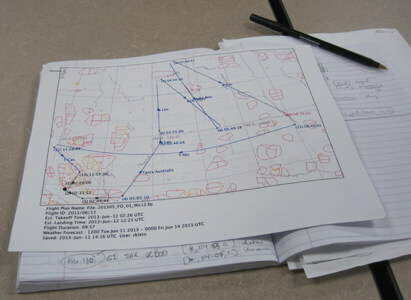 Flight Plan for SOFIA Flight 105 as presented during the Pre-Flight Briefing. 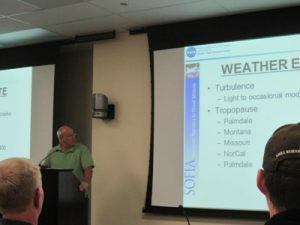 Next we had a briefing about the weather, with emphasis on expected areas of turbulence. Granted it’s never clear when you will hit uneven air, but it was a good mental exercise to think through each flight leg to see what might get dropped if the turbulence got too rough to control the telescope. So we were expecting to have “weather” when we flew over northern Montana, Nebraska and Missouri due to the summer thunderstorms. 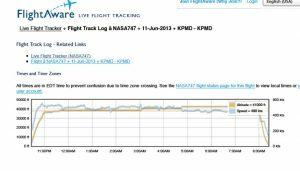 The timeline from doors closed to data transfer at end of flight was discussed. And each key system: aircraft, telescope, and science instrument, reported on their readiness. Upon inspection of the flight plan, it was remarked “You are all going into Canada” and we all inspected that yes the transition from Leg 8to Leg 9 did cross at the Montana/Canadian boarder. 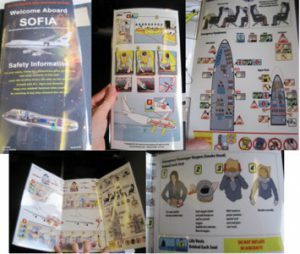 In flight, the Flight Planner actually announced around 12am PDT (07:00 UTC) when SOFIA entered into international airspace, even if just for a few minutes. That was very cool, eh? A SOFIA flight is highly orchestrated. For this particular flight, as we were using specific targets for calibration, we dedicated single legs to one object. 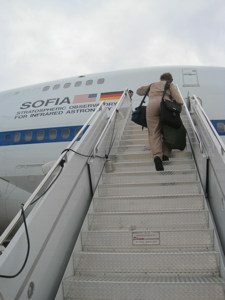 Within minutes after the crew briefing ended, it was time to walk over to SOFIA, which had been moved out onto the tarmac, and climb aboard! We board SOFIA from the taxi-way. The plane had been refueled and ready to go hours before our take-off. Oh, a special surprise! A friend from a leadership development program we did together about 3 years ago (my, has time flown! ), Ed Teets, a meteorologist & atmospheric physicist from NASA Dryden, came to give the pre-flight weather briefing. That was awesome Ed! My friend Ed Teets, atmospheric physicist, from NASA Dryden given the weather briefing for SOFIA Flight #105. 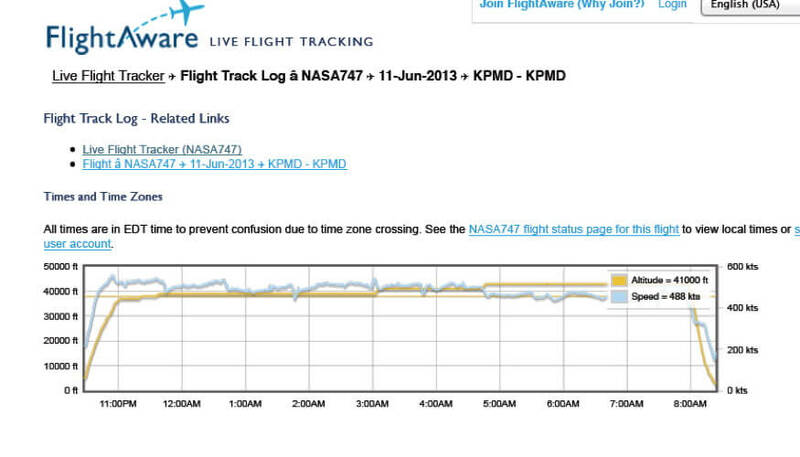 So between takeoff at 7:25pm PDT and landing at 5:25am PDT, the flight planners had to keep us literally on track. There is an official flight plan that the pilots will follow and which has been worked out ahead of time with FAA air traffic control. It’s the result of a complex optimization strategy to calculate where one’s targets are in the sky and visible by the SOFIA telescope at given times and locations of this moving airborne platform, along with ensuring not entering no-fly areas, and of length and elevation appropriate for the amount of fuel on board to enable a 10 hour flight, with about 8 hrs at the desired 40,000 ft elevation. In addition, they need to look at seasonal weather patterns, and then on the final iteration of the flight plan, they take into account the most recent weather predictions. In ground-based astronomy, you can lose time on your objects by being “clouded out.” For airborne astronomy when you are above the clouds, your only threats to observation time are weather-related, but weather of another kind. For Flight#105, we had 13 legs, of which legs #6-12 were “science.” Legs 1-5 were the ascent legs to get up and out of the LA congested airspace and get us to altitude. Leg 13 was the final descent back to Palmdale, CA. As I mentioned in the previous blog, within a few minutes after takeoff, even while we were still ascending at an angle, we were allowed to get up and walk about the aircraft. We used this time to get our computers and laptops all set up. The telescope operators got the telescope (the door is closed) up and running ready to go when the conditions allowed for the door to open. Actually on flight #105, we had to delay the door opening until we got above some high-altitude cirrus clouds, but it did not impact significantly the post-door opening telescope checkout in time for when we got on our 1st target. We stayed all configured even as SOFIA turned between legs. You can see the computer screen on the right is the telescope guide cameras and the streaks are just stars going through the FOV. If you noticed in the pictures I posted, we are wearing headsets. There were not enough headsets for all passengers, so we traded off. The sound inside is like a typical 747 aircraft, maybe a bit on the noisier side (lots of computer racks and not much fabrics to absorb sound), but perfectly fine with ear buds. 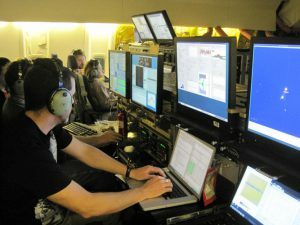 However, wearing the headsets and monitoring the channels helps immensely to know what is going on. There is no “Bleep. 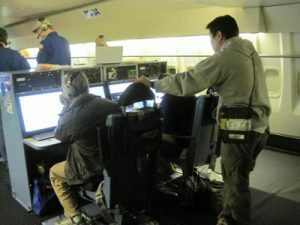 Please return to your seat” automated voice from above, but rather the Mission Director saying on the communication (comm) system “Guys, it’s time to sit down now.” And there is no “call-button” for assistance, you just talk where you are through the headset. 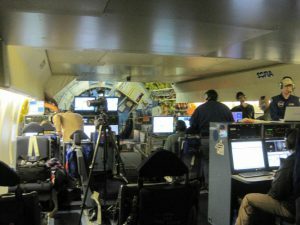 Typical view of operations during a SOFIA observation flight. 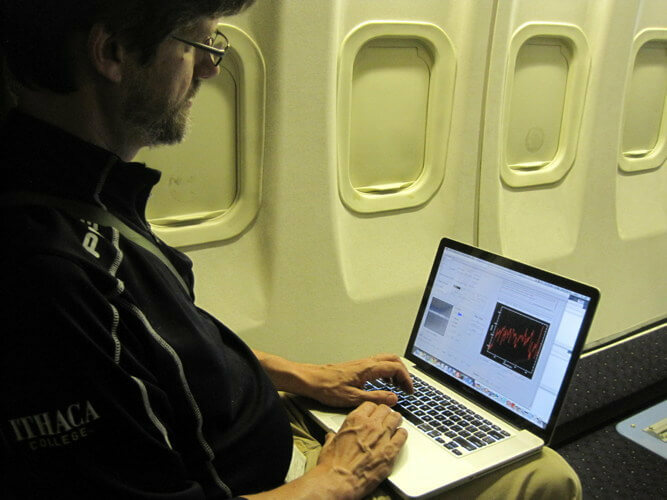 Getting back to headsets…it was quite fun, since part of the flight I was sitting at the “conference table” at mid-deck and we were just chatting with the science instrument folks who were near the telescope as if we were across the table. It was very efficient. We could stay at the “conference table” with our laptops hooked to the on-board internet doing the data analysis and report things we saw in the data to our colleagues who were more focused on trying to take the data and keep to the script schedule and interact with the telescope operators who had to do lots of telescope rewinds and target re-acquisitions. Plus, having this arrangement, kept people from crowded at the consoles. Of course, from time to time I wanted to be “at the action” and I would walk and re-plug in my headset up front if a port was open. Doing data reduction between legs on SOFIA observing flight. 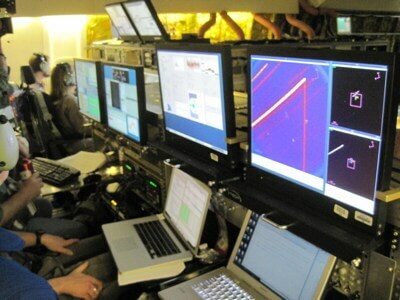 Screens from left to right are: FORCAST control, FORCAST quick-look image display, Telescope Assembly Status Page, and the Guide cameras. In this image, we are executing a short chop of a point source. On Leg #7, between 9:45pm PDT (04:45 UTC) and 10:49pm PDT(05:49 UTC), the pilots flew SOFIA along a leg going southeast from middleMontana to northeast Colorado. Our target was NGC7027, a planetary nebula. It has a distinctive ring shape, and a frequent wavelength calibrator for infrared instruments due to having very strong emission lines. Jim Debuizer, the USRA FORCAST Instrument Scientist, and test lead for these commissioning flights, affectionately called it the “the big glazed donut in the sky.” Perhaps he was getting a big peckish? 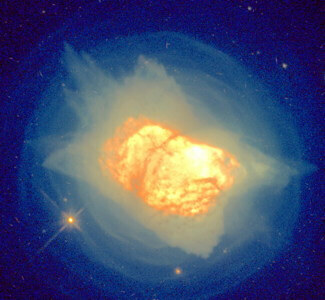 NGC7027 is a young, and rather dense planetary nebula. It’s not particularly large on the sky, with its brightest region measuring about ~8 arcseconds across in the optical. It’s located about 3000 light years away in the constellation Cygnus (coordinates 21h7m1.7s RA, +42d14m11s Dec). 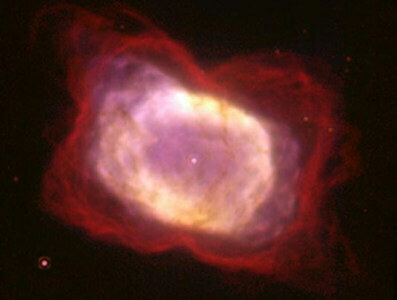 Most planetary nebulae are more extended, covering several arcminutes on the sky. (As a calibrator note, for those who don’t speak arcseconds: the full moon is 30 arcminutes or ½ degree on the sky; 1 arcsec is 1/60th of an arminute.) SOFIA’s FORCAST mid-IR instrument has roughly a platescale of0.75 arcsec/pixel. 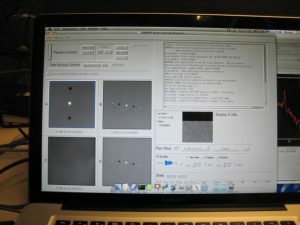 Thus, NGC7027 would appear to be ~11 pixels in diameter on the FORCAST detector. For our grism spectroscopy, we are testing 2.4 arcsec(3.2 pixel) and 4.7 arcsec (6.2 pixel) wide slits, so NGC7027 would essentially“fill our slit.” Thus it would not be a great flux calibrator object as we’d have “slit losses” but it’s infrared spectrum has well-identified and well-spaced emission features that would be useful for our wavelength calibration task. 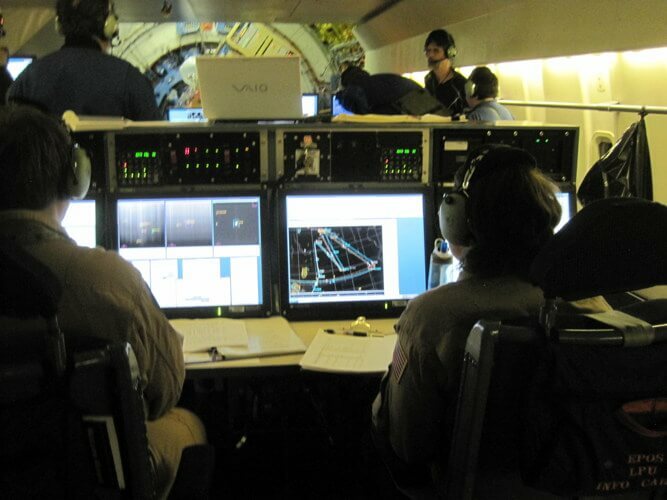 Images showing data reduction of an image of NGC7027 aboard SOFIA Flight#105. Above is an image of our quicklook pipeline as I was processing an acquisition narrowband image (at 11.1um) on SOFIA Flight#105. We used this image to confirm we placed the target in the slit. The team was also testing out SLITSCAN, an observational mode that would be used on SOFIA when observing an extended object using the grism suite. The positive and negative images are the result of the chop-nod observing technique used to remove the background. For more information about chopping & nodding on SOFIA, see my earlier post. 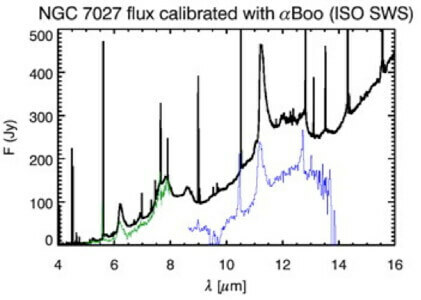 Image showing data reduction of an IR spectra of NGC7027 aboard SOFIA Flight#105. Above is an image of our quicklook pipeline as I was processing our R~300 8-14 micron spectra (not fully-calibrated). We still need to remove the atmosphere. The strongest atmosphere issue are ozone absorptions at~9.5 microns. The emission features of the nebula are shown in our spectra. If you look closely at the 2D spectra on the left, you can see we aligned the slit to capture two edges of the disk, showing as two bright lines on the edges of the slit. 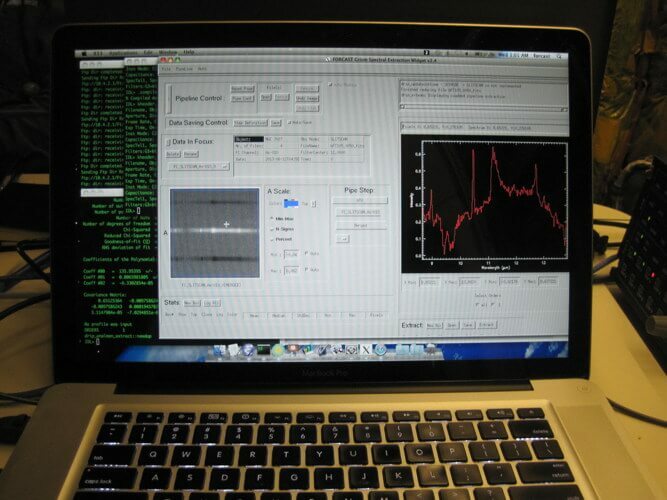 We were observing this object with our grism spectra suite. We took data on this same object last week and started to use it as a sanity check on our in-progress flux calibration in addition to a wavelength calibration. Below is an overlay of two of our grisms (5-8 um and 8-14 um) with the spectra ofNGC7027 as observed by ISO years ago. We now have spectra to cover 17-28 um and28-34 um, and are working on their respective calibration steps. We are using another well-studied source, Arcturus (AlphaBoo) as our flux calibrator. The reason why the 8-14 um spectra in the image below is off is because the data set we took was near-saturation so our various conversions were not optimal. We repeated the observations at lower exposure to repeat the exercise. 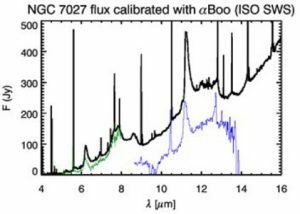 Our working comparison of our short wavelength grism suite data of NGC7027 with previously published observations by the Infrared Space Observatory. It was unfortunate that during this leg (Leg #7) that we hit turbulence and had to stop observing for a few minutes. We got slitscan(observational technique for extended objects) observation in (the goal of the leg), but sadly did not a requested long wavelength grism spectra of this object. However, we obtained other spectra on other objects using the missed-grisms later in the evening. It’s all going to be able piecing together the puzzle now. After boarding, we had some time before the doors closed. A safety briefing was held. Upon entry to SOFIA, one objective, as this was a relatively “full flight” with 30 people, was to stake out a seat for take off(a comment was even made of the ‘Southwest Airlines’ way). Seats are scattered about the airplane for specific purposes and prior to this flight, my colleagues and I had worked out our seating. We could only send one representative to the “conference table” seating area, so Martin Garay (a student at Ithaca College) and I were sent to business class, while Luke Keller (our grism lead, astronomy professor at Ithaca College) sat at the “conference table” midway along the telescope deck. Sketch of the seating on the telescope deck on SOFIA. 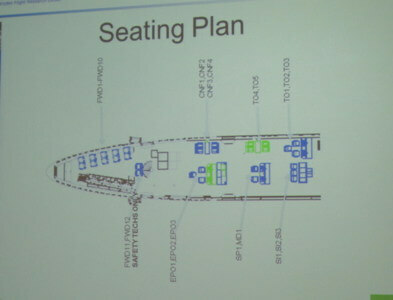 There are additional seats on the upper deck. During the prep for takeoff, I took the moment to inspect the on-board safety information card. It re-iterated what we learned in egress training and what was described as we boarded. Indeed the inside of this 747SP is very different from your normal airline experience and being aware of your surroundings wherever you are is important. Compilation of photos of the SOFIA on-board safety information card. The engines started at 715pm PDT (local time), and we took off around 7:27pm PDT. It was a good 50 seconds for takeoff. 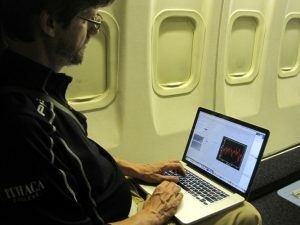 And essentially, it felt like a normal jet takeoff sitting up in the business class section.However, unlike a normal airline ride, within a few minutes we were allowed to get out of our seats. It was just so surreal to be walking down/up the plane during the descent. 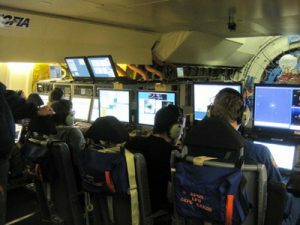 It sort of felt wrong, as we are accustomed to the strict rules on commercial aircraft, but it was so important to use any leg designed to bring the aircraft to the 40,000 ft science altitude, to do non-science things like setting up computers and testing connections between the systems. On this flight, every second counts! And that theme was certainly reiterated throughout the night. By 8pm PDT we were at 35,000 ft. The pilots had already completed 3 legs of a 13-leg flight plan. And at 825pm PDT, the telescope door opened! Within minutes, Joe Adams, the FORCAST lead instrument scientist, had started his first script to check out the detector frame rate settings. 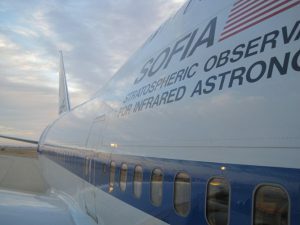 One of the first data acquisitions of SOFIA Flight #105. Target is R Leo. We hit pockets of turbulence during ascent and near the “weather” areas we had been warned about, and although the aircraft seemed to be moving up/down/sideways, the telescope moved as well. It was mesmerizing to see the FORCAST instrument and its counter weight moving about the cabin and yet the position of the star in the telescope guide camera was “rock solid.” Indeed, contents shifting during flight, but not this telescope! Two times during the light, the turbulence got bad enough that we had to return to our seats and the telescope was “secured,” but both episodes lasted less than 10minutes. What was fascinating was that according to the mission manager, we probably lost about an hour due to turbulence. We had to sit down about 2x during the flight for a period of 10-15 minutes. I lost all track of durations of things, as I was focused on what data we lost by these unexpected interruptions. But each time we faced turbulence, we just took it in stride.Around 08:20 UTC (1:20am PDT) we also needed to do small flight diversion from our Leg #9 to avoid some baby tornado clouds. This time the timing was good as we were doing some calibration flats which did not need a target so we could still take data during the diversion. 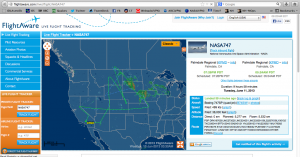 You can see what the actual flight path was by visiting http://flightaware.com and searching on NASA747. Kudos to the pilots for giving us a very good flight and working with the weather patterns! One thing to mention, as we were free to move about the cabin, each of us had to carry with us a EPOS, emergency passenger oxygen system. In case there was a depressurization at 40,000ft, there would not be enough time to get to the nearest seat for oxygen masks. It was a small nuisance to carry a bag with you everywhere, but it did not get in the way of getting the work done, planning, executing, and analyzing the data on the instrument. One of the passengers, a member of the DAOF staff, carrying his EPOS, the khaki-green pouch on a shoulder strap.